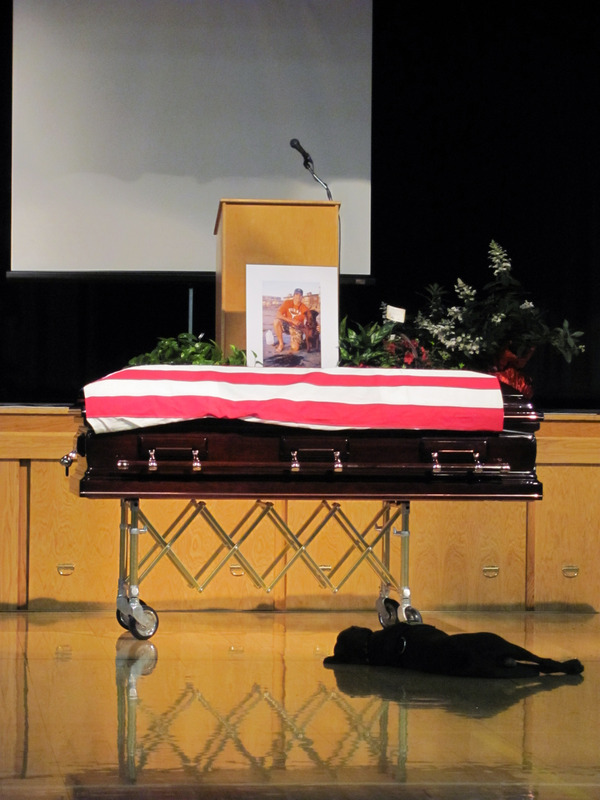 It’s the funeral photo seen by millions – a grieving dog lying below his master’s casket, standing guard. U.S. Navy SEAL Jon Tumilson was among 30 servicemen killed on August 6th an American CH-47 Chinook helicopter was shot down by insurgents in Afghanistan. When family, friends, and loved ones gathered for his funeral on August 19, Tumilson’s cousin snapped the photo that has pulled at heart strings across the nation. It’s a heartbreaking image of devotion and love. ~A little note to ‘Hawkeye’, I’m so sorry sweet dog that your brave master is gone. ~I didn’t know Jon but wanted to thank his family for raising such a dynamic and brave young soldier who gave his all for his country. Special belly rubs to Hawkeye from my four chihuahuas. ~My deepest sympathy to Jon’s family, and to Hawkeye, I am sorry you lost your best friend. ~Please tell Jon’s precious dog Hawkeye that his master Jon will always love him. God Bless Jon. Rest in peace. Hawkeye loves you and so do we. To read more, and to share condolences, please visit the Guest Book. This entry was posted in In the News, Legacy.com Remembers and tagged Condolences, Obituaries, Tributes. Bookmark the permalink.